I need to set up auto formatting for php to have spaces between functions e.g. i know it used to cut lines if you have too many, but now with v6 even that does not work. 1. Automatically adding empty lines in such code (before/after specific code block -- for/if/etc) is not possible. Feel free to post Feature Request to the Issue Tracker. 2. Removing extra lines -- yes -- works fine. 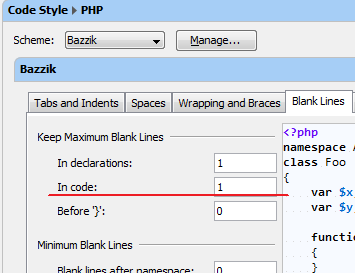 Please check your settings at "Settings | Code Style | PHP | Blank Lines | Keep Maximum Blank Lines --> In code"